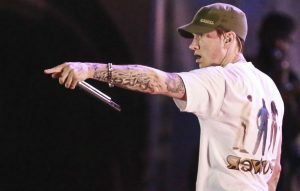 Eminem‘s ‘Lose Yourself’ has been played to a New Zealand courtroom as part of the rapper’s ongoing lawsuit against the country’s National Party. The Detroit rapper filed the suit in 2014 after the National Party released a campaign video for then-leader John Key’s re-election as prime minister – which featured a strikingly-similar version of his 2002 hit – citing an infringement of copyright. Watch the video in question below. The National Party “vigorously” defended the use of the track (entitled ‘Eminem Esque’), which they say they obtained from the Australian production music library Beatbox Music. The Party alleged that other parties had used the track without complaint. The suit made it to court earlier today (May 1), where ‘Lose Yourself’ was played to the Judge-only hearing. AP reported that, during the playback of the track, the judge and nine lawyers listened “politely”. It is not clear at this stage what damages Eminem is seeking. Joel Martin, a spokesman for Eminem’s publishers, told reporters outside court that he was surprised the rapper and the National Party hadn’t already settled on an agreement. Eminem will return to the UK this summer for a number of live dates, including headline sets at Reading and Leeds Festivals and Glasgow’s Summer Sessions. The post Eminem’s ‘Lose Yourself’ plays in courtroom during rapper’s lawsuit against New Zealand political party appeared first on NME.